I got this cactus at our Lifespan volunteer recognition lunch in 2016. Last year I learned about putting it in 12 hours of dark and 12 hours of light to encourage it to bloom. It was gorgeous. 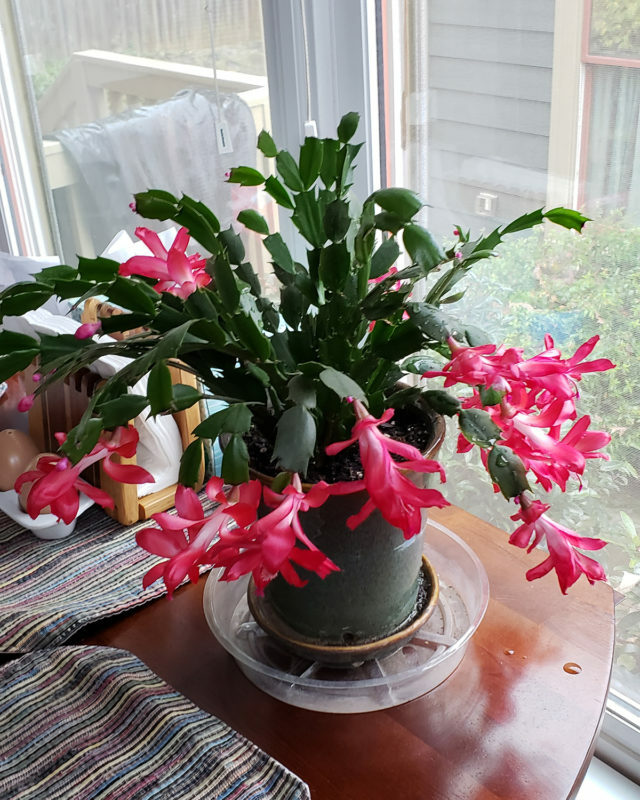 This year it has enjoyed being outside on my porch in the spring, summer and fall, has been repotted twice (thanks to Nancy), and went through its annual blooming ritual again. There are baby blooms on every stem. It’s going to be amazing. Go little cactus go!!! You’ll see the photos on the website, in emails and on our facebook page. So, why a story about a silly cactus? I was thinking about Lifespan and its journey. Since 1981 we have been working to build communities that welcome us as we age, even as our own community is itself, aging. We provide knowledge and information that enables our community to age with choice and agency over our lives. We rejoice in time spent together and grieve together as we say goodbye to those no longer with us. Many of you have wondered, how is Lifespan doing? Will we be ok? Are we changing? What’s the next step in our journey? Lifespan is very much like my Lifespan cactus. We support, water and feed the main part of the plant to keep it strong and healthy. We “re-pot” Lifespan when necessary, giving the roots sufficient room to grow and thrive and trim branches as new ones come on board. All the time we are preparing for the season of blooming. Sometimes it feels like we go through those periods of 12 hours of darkness as we work to figure out Lifespan’s next chapter. We are constantly looking at how the community is changing and the best ways for us to respond. And then we come out into the light and wait for the blooms. Blooms of blessings, joy and hope for the future. Here are some examples of the Lifespan blooms we are nurturing right now! We are working with other organizations, including Jewish Family and Career Services, to build a Collaboration Network of Transportation Services for older adults that will include our MET program. We get calls for transportation services on a regular basis that we cannot meet. This coalition can allow us to be part of a network to serve additional older adults and respond more specifically to what they need. And we are making progress on an MET program in Tucker!! We have seen an increase in participation at academy in our activity classes and technology classes. This next session we are trying “Pop Up Workshops” as a way to test new content and see what else might entice new members. Read more about these workshops HERE. Technology classes continue to be popular for all of our Lifespan members. Take a look at our Annual Appeal page. We are not only seeking your donations this year, but also looking for technology volunteers, teachers and tutors, so we can expand our educational offerings. And finally, the board of directors has unanimously agreed to support a pilot project we are tentatively calling “Partners in Health.” This program is based on the model developed by agencies in Michigan and Massachusetts, utilizing trained volunteers to accompany older adults during their medical appointments. Read more about this program HERE and be on the lookout for an informational meeting in February. You might like to volunteer! Call us. So the answer to your questions about what is the next step? We will see how the blooms develop. You can be part of that process with your donations, suggestions, and offers to volunteer. Fill out the Annual Appeal form and let us know how you will nurture the blooms of Lifespan in 2019!